Check Scanners, Thin Clients, Business Printers, Document Scanners, Barcode Scanners, New and Remanufactured from Vecmar Computer Solutions. Vecmar is a leading check scanner solution provider in the financial and healthcare industries. We stock all major brands - Digital Check, Panini, Canon, RDM, Magtek and Epson. Our extensive inventory, tech support staff, and broad range of maintenance programs gives us the ability to exceed your expectations. Vecmar offers a wide selection of new and remanufactured HP and Dell Wyse thin clients, zero clients and cloud computing devices designed to integrate into any virtualized or web-based infrastructure. Thin clients, zero clients & cloud clients can offer your business a number of advantages including increased security easier upgrades, lower cost of ownership and reduced energy consumpution. Vecmar offers a wide range of document scanner solutions including workgroup, departmental and production level models. Providing both new and remanufactured products, our scanning solutions deliver speed and image quality along with easy integration and compatibility. New or remanufactured, we have what you need to make your business run smoothly. Vecmar's suite of Business Printer solutions help you stay productive, efficient and ahead of the competition. Vecmar delivers efficiency and cost savings to entirely new areas of the enterprise. As a leading provider of remanufactured barcode scanners, Vecmar has extensive experience working with customers to deliver measurable business value whenever and wherever you need it. At Vecmar, we examine ALL of the components of your device. - not just the defective part. We repaint, clean, inspect & test each unit so that it is returned to its original factory specifications. Our proven process helps extend the life of your devices & helps minimize future disruptions. Our Technology Refresh program is designed to upgrade, refresh & remanufacture existing hardware. Customers can trade in equipment for cash or credit towards new products. This provides the framework for the fulfillment of any corporate sustainability program that promotes resource and energy efficiency. We offer a complete product to merchant fulfillment solution to deliver devices and services flawlessly from procurement to retirement. We provide the most comprehensive suite of managed services in the industry including Inventory Management, Hosted, Co-Branded Websites, Asset Management, Technical Support, Advance Exchange, Depot Repair, and Technology Exchange/Refresh programs. 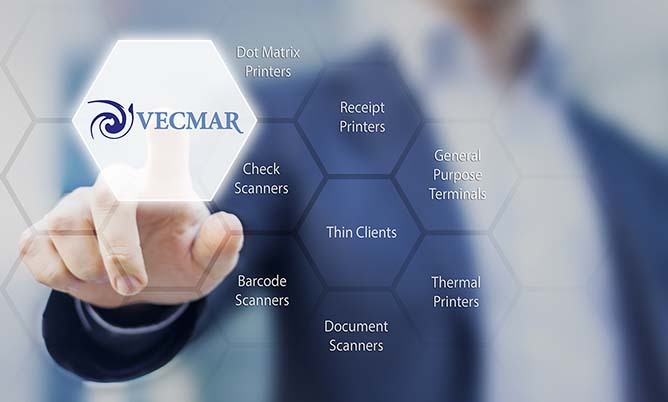 Vecmar offers a wide variety of check scanners, thin clients, document scanners, business printers and barcode scanners that will save you time and money. Many of these popular products are also available as top quality remanufactured models, saving you even more! All hardware products from Vecmar include leading warranties. Call 800-457-8499 (440-953-1119), email or order online today for great prices and quick delivery. When you choose Vecmar, you get the reliability of top brand names at great prices. Our huge in-stock inventory, immediate shipping, and premier remanufacturing process offer you a complete solution that can't be beat! Experience the benefits of Vecmar's world-renowned, unparalleled reputation. We've been offering around-the-world savings since 1990, as one of the largest computer terminal remanufactures as well as one of the largest NCR custom configuration houses in North America. As a recognized leader in system and peripheral solutions, our customers and suppliers depend on our expertise. You'll get the assurance and security of over 25 years of technical experience. We provide you with superior service and unwavering customer support. Our sales and technical support departments are fully prepared to answer any questions or respond to any requests you may have. VARs, system integrators and end users around the world choose Vecmar for our ability to meet deadlines, budget goals and technology requirements. When you choose us for your next computer hardware purchase, you'll know you made the right choice. Nobody works harder to satisfy customers and provide better computer equipment at greater savings than Vecmar. Call us today at 800-457-8499 or 440-953-1119 or email sales@vecmar.com and we'll prove it.